Stains from coffee, tobacco, red wine, and tea can mar an otherwise attractive smile. Thankfully, patients can safely remove stains and discolorations long-term with professional teeth whitening from Isaacson Dental. You can choose from whitening in Oklahoma City with the one-hour ZOOM! 2 system or whitening at-home with our custom teeth whitening trays. Why Choose Joe Isaacson Dental for Teeth Whitening? ZOOM! is the leading whitening system and is well-known for its dramatic results. With ZOOM! 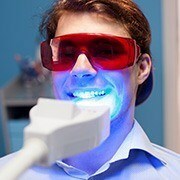 2, we can safely lighten teeth up to 14 shades in about an hour. ZOOM’s patented whitening gel and no-heat activation laser deliver amazing results that last long-term. You can visit our Oklahoma City office on your lunch break and leave with a noticeably whiter smile. Alternatively, take-home teeth whitening provides patients with more control over how much they lighten their teeth. You’ll simply visit our dental to receive whitening trays that are designed based on impressions of your teeth. Then, you’ll fill the trays with the solution we provide. Professional at-home teeth whitening is much more potent than over-the-counter bleaching methods, lightening teeth up to 10 shades with 1 to 2 weeks of continued use. Dr. Isaacson is your TOP Oklahoma City dentist, and he can help you decide which method of tooth whitening is right for you. We also offer teeth whitening alternatives, such as Lumineers and porcelain crowns. Not only do you have the option to explore other cosmetic options when you choose to visit our office, but you’ll also be able to feel confident in your ultimate cosmetic treatment plan because they will be conducted by a professional. When you choose to try an over-the-counter product to whiten your teeth or with a cheap alternative you can order online, you’re not guaranteed to get the results you want. Plus, you could be risking the health of your soft tissues! It’s better to trust a dentist with your whitening procedure because your dentist will always make sure to protect the health of your smile. We will always make sure you know what to expect before, during, and after your treatment, such as the slight feeling of sensitivity that may occur. Before you know it, your teeth will be noticeably brighter! Your teeth will be brighter by at least 8 shades on average! We use Professional-strength bleaching products that are monitored the whole time by our dental professionals for optimal safety and success. Special accommodations are made for tooth sensitivity or other oral health concerns. Long-lasting results are achieved in a much shorter amount of time than what drugstore products could accomplish. You’ll look and feel years younger when you finally take the initiative to schedule your teeth whitening appointment today. Contact us to schedule the next available time slot and achieve a better-looking smile!